Even before graduation, J.C. Albritton knew he had a passion for institutional development. This interest started in his service work and has carried over to his career. With the influence of Berry College’s Bonner Program, J.C. gained the skills and the grit that has have enabled his success as Milton Academy’s Young Alumni Giving Officer. J.C. credits fundraising opportunities at the Boys and Girls Club and local community foundations for opening his eyes to the power of giving. Indeed, this passion led him to pursue a position with Berry College’s development office, an internship that turned into a full-time job following graduation. As the Young Alumni Annual Giving Officer at Berry, he describes his job as more “friend-raising rather than fundraising,” and a place where relationship-building skills he learned from Bonner help him thrive. 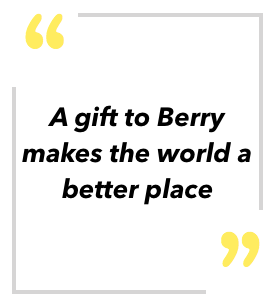 One of J.C.’s proudest accomplishments while working for Berry is a service campaign embellished by the core tenets of Bonner, including showcasing alumni and students who were doing service work all around the world. Though J.C. was thriving in his alma mater’s development office, he missed working closely with people. He took that ache as an opportunity to move to Boston and accept a position with Milton Academy, a K-12 independent school that teaches 1,000 students from all over the world. Though J.C. adores Milton Academy, even wishing that his high school was as progressive in exploring diverse identities at such a young age. He still enjoys connecting with the community outside of the school, such as volunteering, to avoid the burnout that may accompany careers in higher education. J.C. admits that getting to where he is today wasn’t easy. After moving to Boston, the biggest life decision he had ever made, he had no local friends or family to support him through the transition. He struggled to adjust, but once “I became my biggest cheerleader,” J.C. was able to survive the Boston winters and start thriving in his new position. “Bonner taught me how to be a high-performing individual, to reflect, and how to be me,” he relays. With Bonner being the most influential experience J.C. had throughout college, he thanks the program for providing life lessons and teaching him the skills that he needed to succeed in the world. In the future, J.C. would like to pursue a Master’s in Business Administration and hopes to work with larger fundraising efforts. For now though, J.C. is content contributing developmental success to the high-quality education that Milton is able to provide.